East Herts Borough Council have now released their Green Belt Review paper, some of the potential changes to the Green Belt include some land near to Panshanger Park. The review document covers 25 shortlisted parcels of land in the EH area. This aim of the exercise is to explore where and how the Green Belt boundary could be moved in order to free up land for development as part of the Local Development Framework, which East Herts and all other local councils are currently working on. Welwyn Hatfield Borough Council is currently pursuing it’s own review, this may also involve parcels of land close to the western end of Panshanger Park. 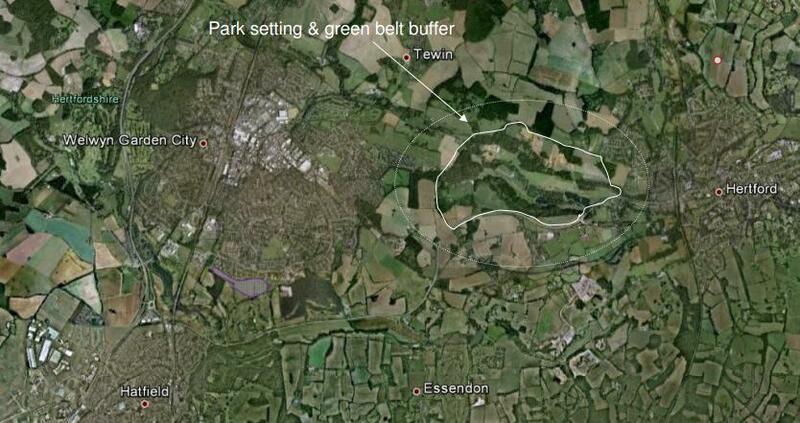 The full Green Belt review document can be downloaded by clicking here. The diagram below shows the areas currently being considered as they related to the park, shown in dark green. There is a stringent criteria to be met before any area will be actively considered, details of all of this and more can be found in the very detailed document found in the link above. Friends of Panshanger Park will continue to follow developments. Here is how the area around the park may look by 2030 if the curently proposed housing developments were to go ahead. Numbers are numbers of homes. Click to enlarge.